Prominent large rounded ears. Very large body size compared with other feral deer species. Sambar are Australia’s largest feral deer species. Males may grow to 2.4m long and weigh 300kg, and females may grow to 2.4m long and weigh 230kg. Their coat is coarse and uniform in colour that varies from red-brown to almost black, but predominately dark brown. The tail is black with the under-tail and inner sides of the legs paler in colour. When alarmed the tail is raised. The hair around the neck is coarse and mane-like, particularly on mature males. The antlers of mature males usually have three tines, however the number of tines is influenced by animal condition. Antlers may grow up to 75cm in length. They have a distinctive honking/ barking calls when alarmed. Sambar were introduced into Australia many times between 1861 and 1912. They are often regarded as solitary animals and are almost never found in herds. They are herbivores that graze a wide range of grasses, shrubs and trees, depending on the season and food availability. They are semi-nocturnal preferring to remain hidden during the day. They can breed throughout the year, with a peak in September and October. Sambar can hybridise with rusa and produce fertile offspring. They can also easily swim with their bodies fully submerged and only their head above water. Feral populations of sambar are established in South Australia, Victoria and NSW. They are absent from other states. Prefer closed woodlands, forests and thick timbered farmland. 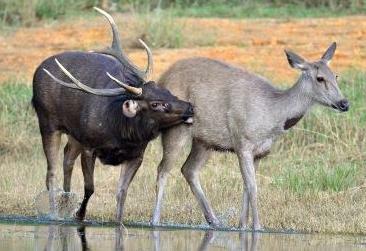 Feral sambar are a growing pest threat. They can cause damage to forestry plantations, ornamental gardens and can damage farm fences/gates. They can compete with livestock for pasture, are a major motorway hazard due to the size and semi-nocturnal behaviour. They also damage native vegetation and sensitive habitats. Control options for sambar deer are similar to other species, including ground and aerial shooting, trapping and exclusion fencing.